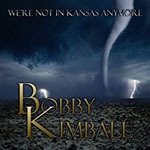 Share the post "Album review: BOBBY KIMBALL – We’re Not In Kansas Anymore"
For many, Bobby Kimball is the definitive voice of Toto and performed with that band during the halcyon years of 1978-1984 (rejoining and touring 1998-2000). Since that time he has forged a semi-cabaret existence schmoozing at “rock tribute” events and occasionally surfacing on collaborations such as Yoso (2010) and the joint album with the late Jimi Jamison (2011). His third solo album release sensibly steers clear of Toto territory. Instead – as on the opener ‘Too Far Behind’ – there is a nice R&B groove that gives full rein to his still powerful and soulful vocals. ‘On My Feet Now’ and ‘Some They Do’ are punctuated by a nice, swinging brass section. Throughout there’s some great rock guitaring from co-writer Dave Barnett, Adam Schwem, and Arnie Vilches (on ‘Flatline’). ‘One Day’ – where he shares vocal duties with Jonny Zywiciel – comes closer to a Toto-style ballad and the funky undertow is only broken by a surfeit of fairly average ballads – even though all are a good vehicle for Kimball’s impassioned vocals. Personally, it’s a shame that this album didn’t sustain the vibe, and the promise, of that opening track. This entry was posted in ALBUM REVIEWS, ALBUM REVIEWS (Mobile), All Posts and tagged album, AOR, Bobby Kimball, Derek Sherinian, melodic rock, review, soft rock, Toto, We're Not In Kansas Anymore. Bookmark the permalink.